With a surplus of paradise beaches, palm-fringed islands and a blissfully relaxed way of life, the Caribbean has been known and loved as a tropical paradise by travellers all across the world for decades. But there’s something else that is starting to pull in the crowds – and it’s not the rum! From soulful street food to exquisite fine dining, the Caribbean is nurturing a blossoming reputation as a culinary haven. After a tough day at the beach in the Bahamas, the only thing to do after the sunsets is to stick around the golden sands and head towards the lights of whichever establishment starts to glow. Freshly-caught snapper and grouper are thrown on the barbecue and fried en-masse at the local fish-fry. Cold beers are opened, music drifts on the evening sea breeze and bonfires rage, with locals gathering to dance the night away. Simple and effective, the classically Caribbean carefree atmosphere is the perfect garnish for the piping hot catch. Conch salad has long been a classic Bahamian dish. Those huge pink shells, iconic mascots of the Caribbean, house a large tender mollus that local divers discovered can be picked, chopped and blended with herbs, tomato, onion and pepper to create for a simple savoury staple. 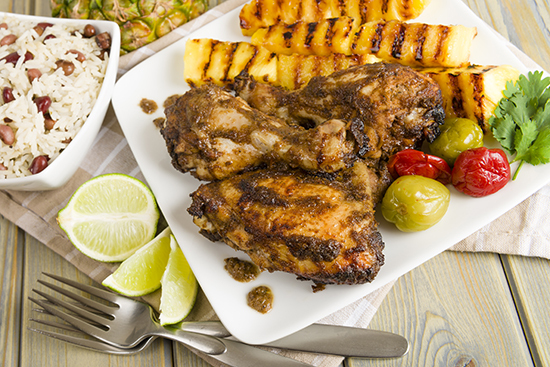 Though the Caribbean as whole makes a mean jerk chicken, Jamaica is the undisputed king of all things jerk. Jamaicans will slap this fiery marinade on everything, and own it. Though you may never learn the secret of the sauce, nothing will stop your taste buds from enjoying it. And if that wasn’t enough of a gift from one country, strong-stomached souls should also tuck into Jamaica’s other famous dish: hot curried goat. 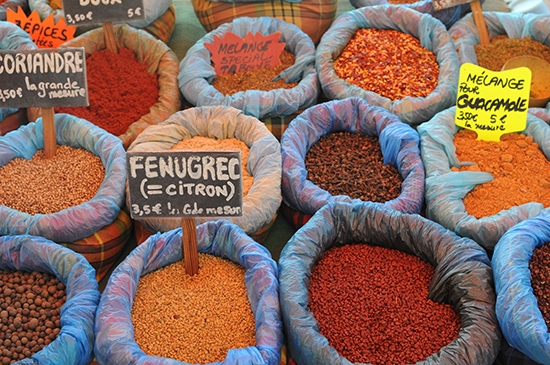 To find out what happens when French, Creole and Caribbean cooking styles collide, a visit to Martinique is in order. Like Guadeloupe, the French colonial influences extend further than the country’s architecture or language, and runs deep into its culinary scene. The island’s signature spice, Colombo, blends a range of French, West and East Indian flavours, including turmeric, brown mustard seed, hot pepper, bay leaf and coriander, and can be found everywhere from your plate to the supermarket shelves. The island is also one of the best places to try accras. Spiced cod or salt fish fritters are a firm favourite across the Caribbean islands and are often enjoyed as a snack or wedged between slices of baguette – the way they were eaten by 20th century workers. Colonial influences roam freely through the menu on Curacao, but one dish in particular resonates clear European roots: keshi yena. Meat or fish and vegetables are stuffed into a Gouda or Edam round and baked. Cuba is known for many things but perhaps most famously, it is one of the last places on earth where you can step back in time the moment you hop off the plane. The streets of crumbling, colourful Havana are lined with vintage classic American cars, so it’s fitting that the Cuban national favourite dishes are unaltered by time too. Settle down in the home of the rum with a mojito to watch the fifties scene roll by and order a sandwich – yeah, that’s right, a sandwich. Tuck in to a simple bread-plus-suckling-pig combo with pickles, mustard and melted cheese oozing through your hands; your stomach will thank you. West and East Indian roots have clashed in Trinidad and Tobago, to make the Port of Spain one of the Caribbean’s foremost culinary experiences. 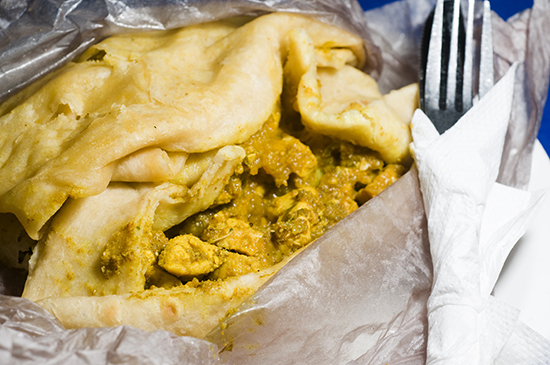 Fine restaurants have set up camp in the island, but the real charm lies in the enticing roti stands that line the streets, simmering with locally-produced spicy treats. Try curried mango or pineapple chow – but be warned, while most fruit in the island nations is fresh, juicy and delicious, these delights have been spiced with cilantro, hot pepper and chilli powder. 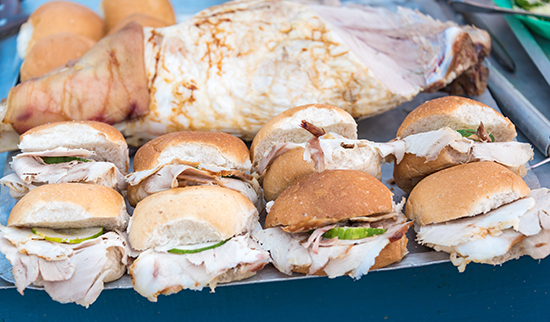 For a story to brag about back home, head to Maracas Beach for a fresh shark fillet; breaded, seasoned and fried, served in a roll. 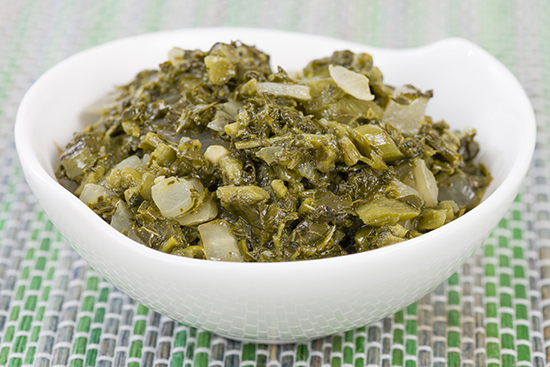 Simple yet scrumptious, callaloo should feature on the ‘must-eat’ list for Caribbean visitors. Brought to the Caribbean by African slaves, callaloo is a spinach-esque leafy green accompaniment made in a dish of the same name. Seafood (often crab), peppers, coconut milk and callaloo are rustled up into a hearty stew that has remained a staple part of the Dominica diet for centuries. With Latino, Indian, Spanish and African roots influencing its historic cuisine, Puerto Rico has produced a signature cooking style known as cocina criolla. 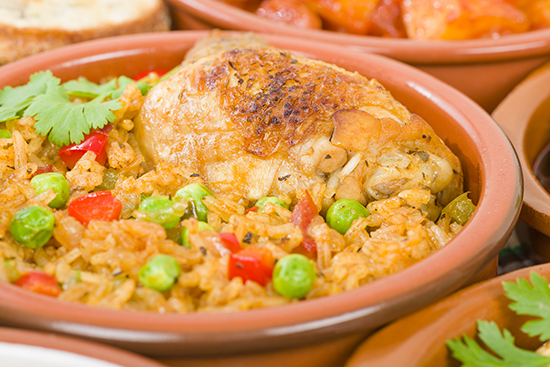 Succulent roasted pig and seafood paella are regulars on the menu but if you strip the traditional dishes back to the basics, it’s easy to believe that the Puerto Rican kitchens know more ways to prepare rice, beans and plantain than anywhere else. Have we got your juices flowing? Is drool dripping on your keyboard? Speak to one of our Travel Experts about booking your Caribbean Beach Escape today, and start planning how you're going to experience the cuisine for yourself.